When news broke that the folks promoting the Who’s upcoming concert in Providence, Rhode Island would honor tickets from the group’s canceled 1979 appearance in the city (considering the band hasn’t played a gig there since), we wondered just how many fans would be able to locate their three-decades-old tix — and be willing to part with them now, after all these years. It turns out 10 hoarder fans took them up on the offer to trade in 14 tickets to see the Who’s surviving members, vocalist Roger Daltrey and guitarist Pete Townshend, and their backing band play the classic 1973 rock opera Quadrophenia from front to back. After tickets went on sale, the Associated Press managed to track down some of these fans, whose patience was finally rewarded. Emery Lucier was 17 in December 1979 and recalls being so angry over the cancellation that he kicked over a chair in his high school classroom. He’d actually paid $25 for the $11.50 ticket after scalper’s fees. AP reports Lucier, now age 50, hasn’t had the opportunity to see the Who since then. Another 50-year-old, Ed McConnell was supposed to attend the show with 15 friends. With hindsight being 20/20, he still doesn’t agree with then-Mayor Buddy Cianci’s decision to cancel the ’79 show after hearing about a Cincinnati show earlier that month where 11 fans were trampled to death. He cites the fact that the Providence venue — known as the Providence Civic Center in the ’70s, but since renamed the Dunkin’ Donuts Center — has assigned seating as a major differing point from the Cincinnati show, which had first-come-first-served seating. Sandy Ball, whose age AP didn’t report, recalls her brother, who was a college freshmen at the time, waiting overnight for two tickets. “We had to talk him off a cliff,” she said of the cancellation. Since her brother was in the military, the tickets moved with him 16 times over the years. Finally, AP caught up with 53-year-old Barry Belotti, who now lives in Fitchburg, Massachusetts. Over the years, he claims to have seen the Who 100 times. He had a block of second-row seats for the ’79 show, many of which he’d purchased for friends. He returned most but kept one for a scrapbook of Who memorabilia he has collected. He intends to see the group play four or five times on this tour. 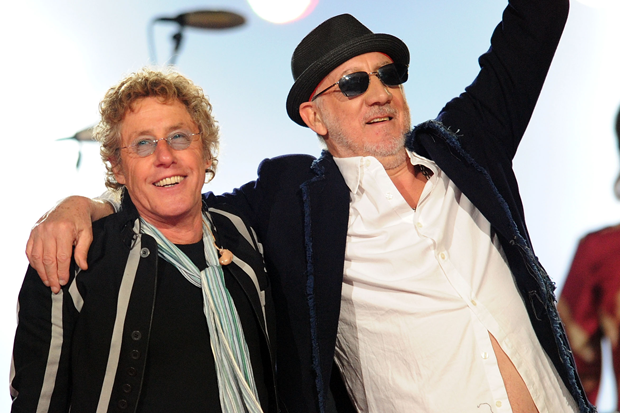 “[The Who’s music] was very instrumental in my adolescence,” Belotti told AP. “Townshend’s writing, he was talking about me.” Well, we’re talking about you now, sir!